It used to cost an arm and a leg to ship anything, now it's both arms and both legs, I ship small items quite a bit with eBay so I'm always looking for a way to cut my shipping costs. I got this tip from my Aunt who ships quite often to my Cousin in the military so she knows what she's talking about. Her point about the flat rate boxes is a good one, I have used them a few times in the past but didn't think about making sure my items were heavy enough to make it worth it. Here's what she says: USPS flat rate boxes are very convenient. But, they aren't always the best deal. If you are sending items that don't weigh much, such as clothes, and you aren't sending them to Alaska, it's probably less expensive to put them in a regular box and send them. But, if you are sending books or a mortar and pestle, or jars of homemade jam, flat rate boxes are a great savings. 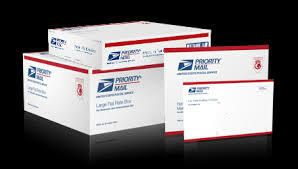 And, USPS will give you $2.00 of a large flat rate box sent to anyone with a military address. Make sense right? I also didn't know about the $2 discount for large flat rate boxes if you are sending to a military address. Thanks for the money saving info!